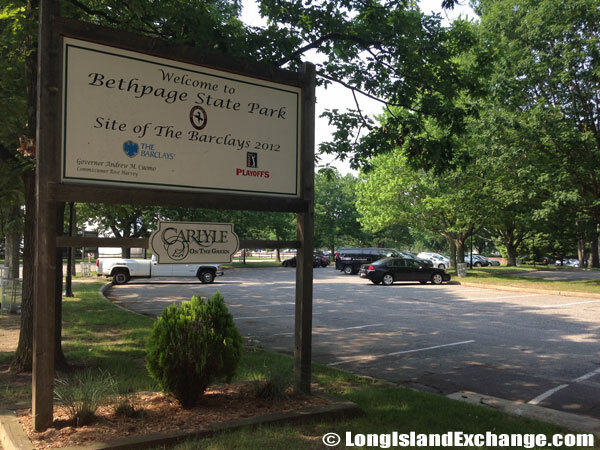 Bethpage State Park is located in Farmingdale and runs along Round Swamp Road from Main Street in Farmingdale to Old Bethpage. Directions: Long Island Expressway (Route 495) east to exit 44S, Seaford/Oyster Bay Expressway (Route 135) south to Powell Avenue Exit 8, east to park. 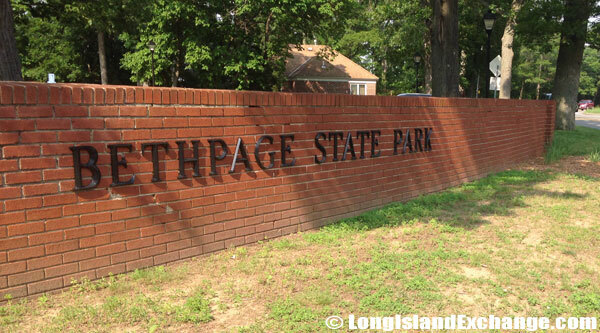 Brickwork welcomes visitors to Bethpage State Park, a 1,476-acre state park on the border of Nassau and Suffolk County. The term Bethpage is a Biblical reference to a strip of land that lies between Jericho and Jerusalem. 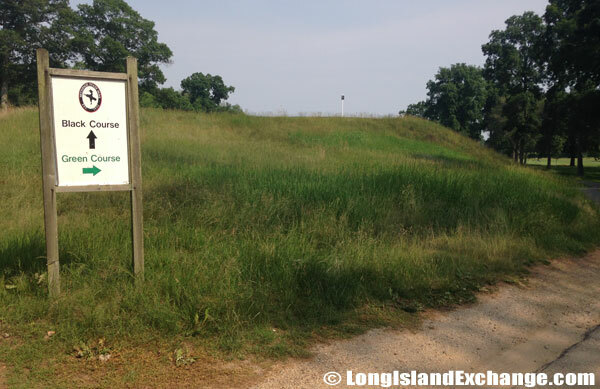 According to a local Nassau County historian, Robert Moses named the area. 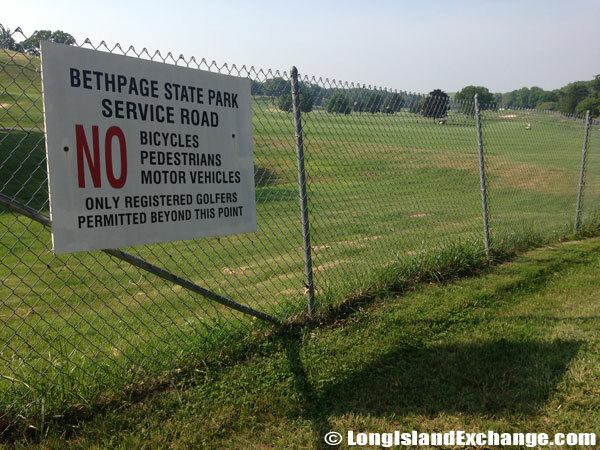 A sign welcomes visitors and members to the Bethpage State Park restaurant and parking areas. Bethpage is home to five championship courses, including world-renowned Black Course that was the site of the US Open for several years. While the Black course gets the modern day recognition, the Green was built in 1923. 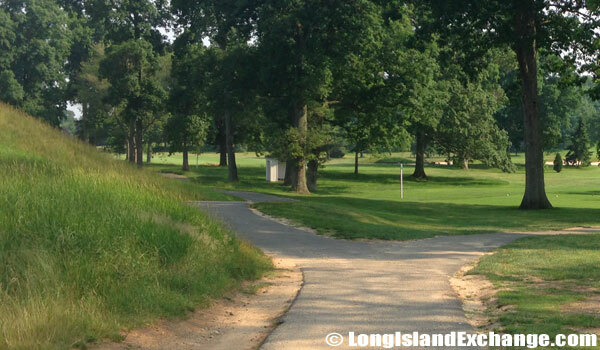 Walking along a pathway within the Bethpage State Park golf course, on the east side of Round Swamp Road. 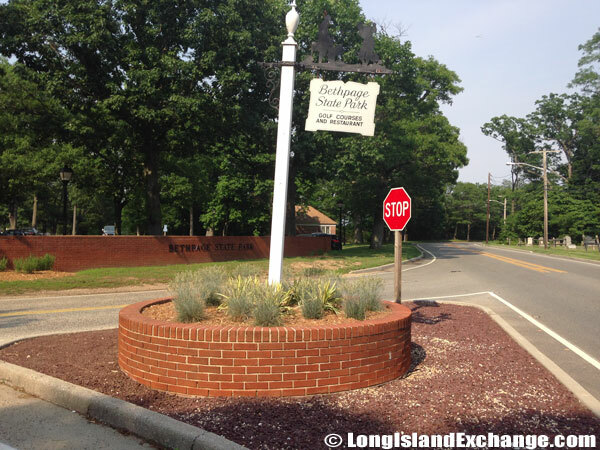 Area: Many of the entrances and crossings for Bethpage State Park Golf Cources are located along Round Swap Road between the end of Main Street in Farmingdale and Old Bethpage Road/Spagnoli Road, Old Bethpage. A sign reminds onlookers that no bicycles, pedestrians or motor vehicles are permitted beyond this point. 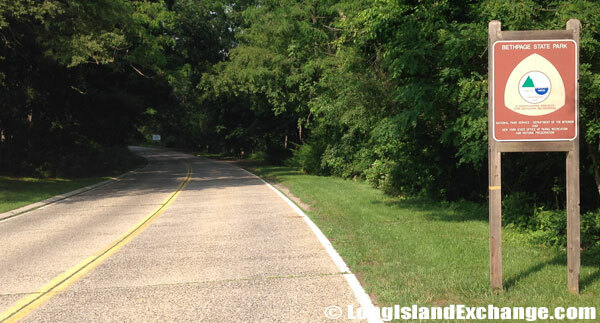 Looking into the course on the west side of Round Swamp Road. 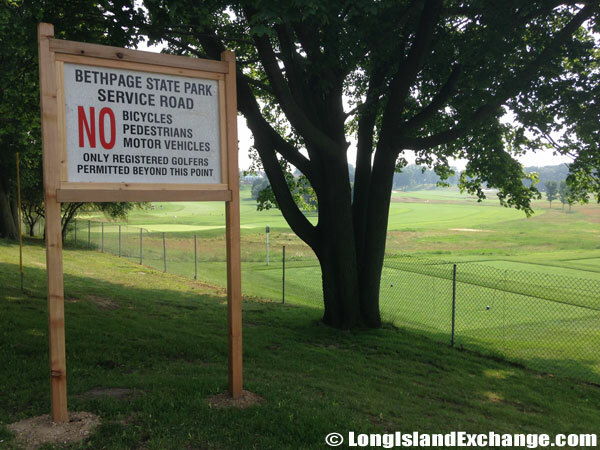 A sign welcomes visitors and members to the Bethpage State Park restaurant (Carlyle On The Green) and parking areas. 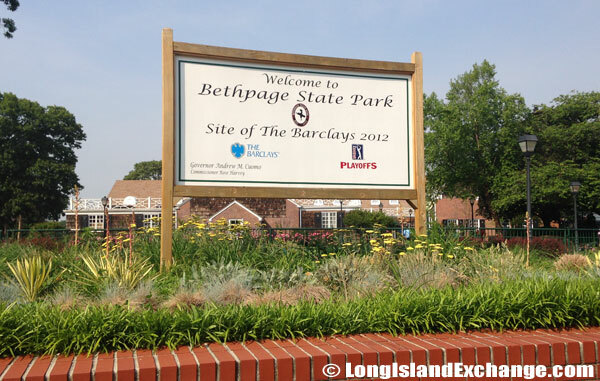 Another sign inside the parking area that welcomes visitors and members to the Bethpage State Park where Tiger Woods played during The Barclays Tournament in August 2012. Overview: Everyone can enjoy the 1,476-acre state park which is best known for its world-class golf courses, including the world-renowned Black Course. 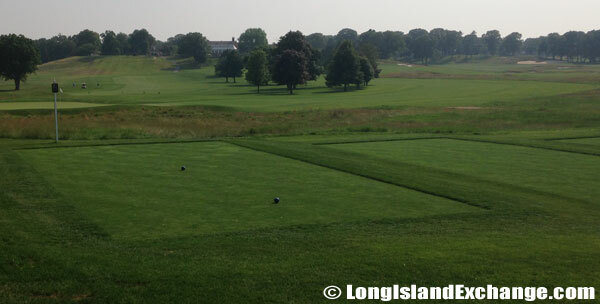 In fact, the Black Course became the first publicly owned and operated course to host the U.S. open in 2002 and will again host the U.S. Open in 2009. 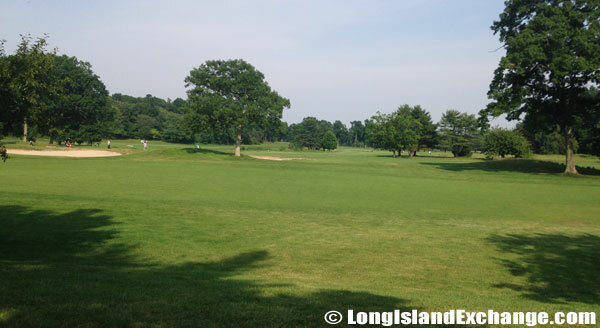 The Bethpage State Park has five eighteen-hole golf courses, named the Black, Blue, Red, Green and Yellow, in decreasing order of difficulty. One of several spots around the park for members to sit, relax and take it all in. 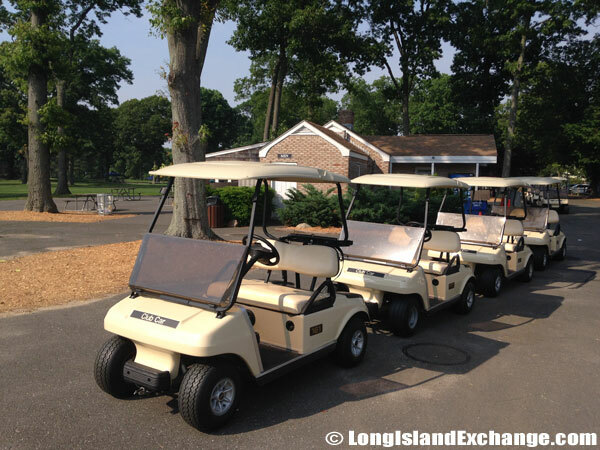 Golf carts are available for rental although Bethpage Black is a walking only course and there are no motorized golf carts available. A sign shows the putting green open while suggesting limited chipping for the safety of others. 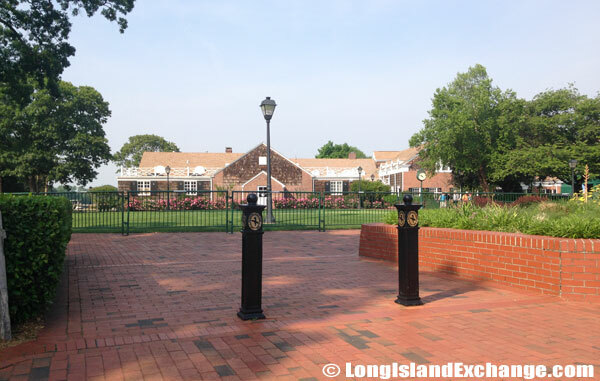 Bethpage State Park has more than 80,000 York Flashed Pavers leading towards the members areas and restaurants. Golf Digest has ranked Bethpage Black #26 in its most recent list of America’s greatest golf courses, #6 in the state of New York, #6 of America’s 50 toughest courses, and #5 in its list of America’s greatest public golf courses. It is also considered the top-ranked course in the Golf Digest list that is operated by a governmental entity. 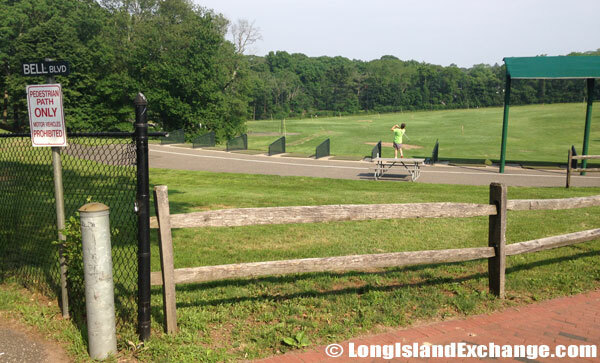 The Bethpage State Park has a 26 tee driving range at Bell Boulevard near the parking areas. Heading towards the park from the Bethpage State Parkway traffic circle in Bethpage. The clubhouse, registration, catering, the restaurant, pro shop, driving range and tennis courts are all within the main parking field are. 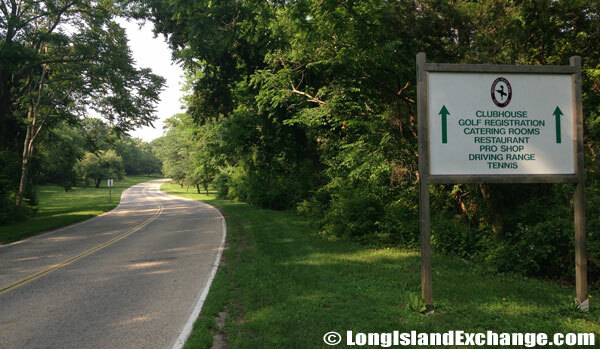 History: The Bethpage State Park once operated as a very small ski area with a tiny vertical drop on Long Island. It was operated from 1951 until 1971, but may have been closed at some point in between as no guidebooks mention the area from 1951 to 1971. There was a 400’ rope tow which served a 100’ drop that operated only when sufficient snow was present. This area had no snow-making. It likely closed due to its small size and lack of snow. 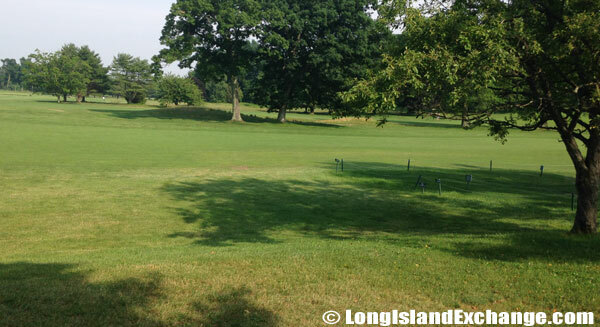 Looking into the Bethpage State Park golf course, on the east side of Round Swamp Road. Facilities: Vacationers flocks to the park may utilize the park’s picnic facilities, playing fields, tennis courts, bridle paths, hiking and biking trails and cross-county skiing trails. 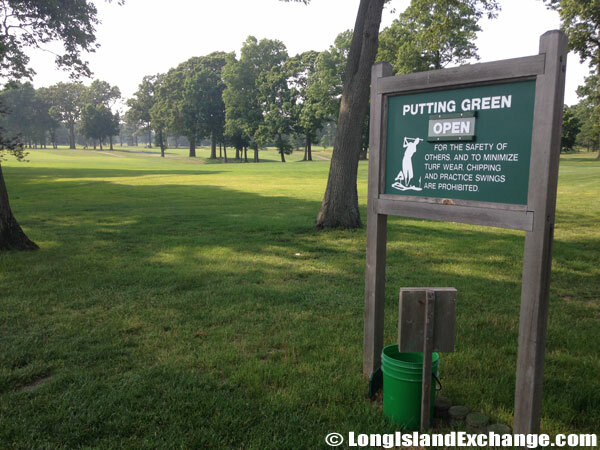 Bethpage State Park houses a restaurant and catering facilities, a Golf Pro Shop and driving range. The park also has a weekly handicap accessible polo field. Matches are played every Sunday from June through mid-October. Call park office for more information. Fees: The fees to play the Black course are $135 weekdays / $155 on weekends. Residents can play for $70 and $80. 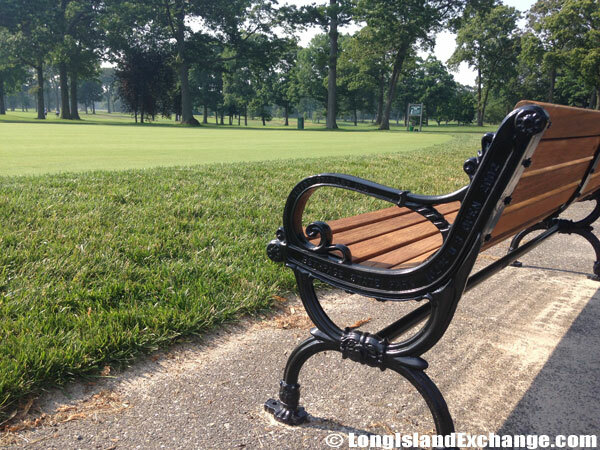 Fees on the other four courses at Bethpage range from $38-$43 weekdays, $43-48 weekends, with Senior Citizens enjoying a 20% discount weekdays only.